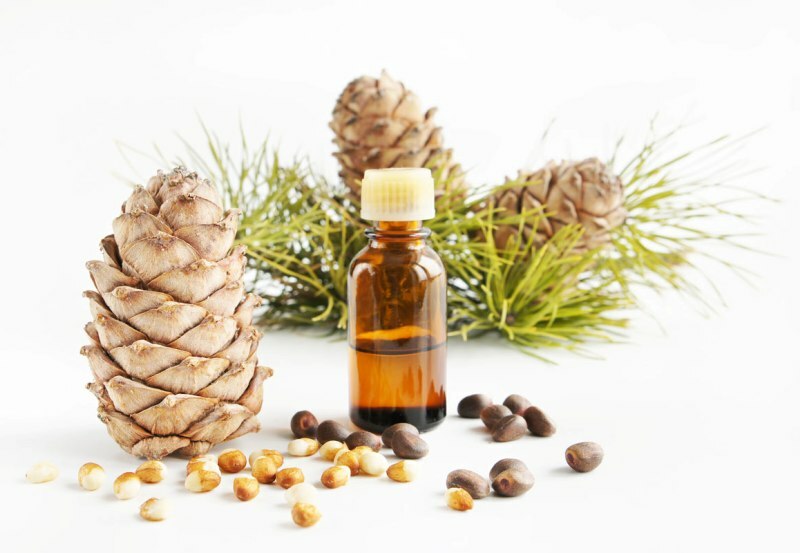 Cedar oil – what is it? Cedar oil is derived from the nuts of a Siberian Pine. It is willingly used in beauty products. The best effects are obtained when used in the form of a pure oil or combined with other natural oils. The product is obtained by cold-pressing. Additionally, it must be unrefined in order to keep its valuable properties. What does cedar oil contain? Cedar oil is rich in linoleic acid from the omega-6 group (about 72%). The product improves processes taking place in cellular level and slows ageing. Omega-6 fatty acids are perfect for damaged hair of high porosity. Moreover, cedar oil contains five times more vitamin E than olive oil. Thanks to this feature, it will take care of beauty and youth of your strands a lot better than other available cosmetics. The content of vitamin E makes hair grow faster and prevents hair loss. Vitamin B1 – is responsible for proper hair growth. It Rebuilds and strengthens hair shaft. Lack of this vitamin leads to excessive hair loss. Furthermore, cedar oil is also great source of mineral components. It is valued for a high content of magnesium, iron and zinc. They do not only influence hair growth but are also responsible for hair thickness, shine and resilience. Additionally, they prevent premature graying. How does cedar oil work in haircare? Cedar oil moisturises even extremely dry strands, fixes any defects on the surface of the stem, increases shine and strengthens hair roots. What is more, cedar oil coats wisps with a protective layer that prevents water loss as well as toxins from penetrating inside. When it comes to the content of vitamins, minerals and omega-6 fatty acids, cedar oil outclasses other oils used in hair care. After using this product regularly, you will notice your scalp cleansed and hair full of shine and strength.